In this blog I would like to talk about how spirit still have friendship ties which are the same as those formed on this level. The circle was still with members going into trance and those who could reporting on spirit apparition and if anything was felt, heard or sensed. A few minutes in spirit voices were picked up and one male energy who was lively and clearly wanted to say something was seen. He had shoulder length dark hair and soul full eyes with a face which was alight with kindness and humour. He spoke first of a friend, someone he wanted looked up and that if he could be talked about it would please him enormously. 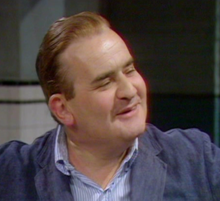 Ronald William George also known as Ronnie Barker was born on 25th September 1929 and passed on 3 October 2005. It is very important to me that when a spirit comes through in a trance circle it is documented for reference and to later appear in the blog as an event to be noted. It was this gentleman the male entity was so keen to speak of and on the day he was looked up on Wednesday it was as you can see nothing other than the subject’s birthday. Ronnie Barker was an English writer but at his heart a comedy actor who made the world smile. He was a broadcaster, radio star and critic who became famous in programmes Porridge, The Two Ronnies and Open All Hours. He began to act in the theatre in comic circles he was soon becoming a legend. In the West End he was a main figure for The Real Inspector Hound. The Oxford Playhouse was where he met Ronnie Corbett who was to be his comic partner. He opened up an antique shop with his wife Joy later in life and was to be a loved celebrated individual. Heart failure was the mean for his passing to spirit. In the seance Ronnie’s friend an actor who has passed gave an impression of who he was. In 1978 he received an OBE and his tv series Going Straight won him more fans for the indisputable life he gave to anything he put his mind to. Open all Hours and Porridge were both something that Ronnie made and won the heart of a nation and the male energy who came to the circle was a partner for him in the latter appearing as a cell mate and the two were on television a pair who sparked off each other and in the meeting that evening made it evident that friendship was not lost. Members watched as the sense of laughter and joy came around the room with two men both famous for being friends came through to celebrate on the eve of the birthday of one. Other incidents for recording of which occurred that night was shaking of medium’s seats as direct speech was noted and lights going down of their own accord each time either of the individual was seen it is beleved that the lights were doing what they did because of the amount of electrical impulse an apparition can emit and whilst all the visible evidence of the evening was appreciated above all the friendship of the two comedy greats shone through. Picture is Ronnie Barker. Picture is taken from online encyclopeadia.